George MacMinn photographed by Deddeda White. With renewed attention being paid to the position of the clerk of the B.C. 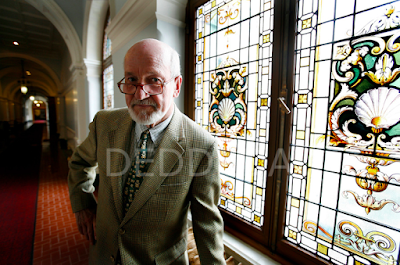 Legislature, here's a profile of George MacMinn, who spent a half-century in the post. George MacMinn's office contains one of only two working fireplaces in the capital's historic parliament building. His desk has a plaque marking it as once having been used by the Queen. Such perks are the reward for someone whose workday includes interminable hours at a table on the red-carpeted floor of the legislature. He is the clerk of the British Columbia Legislature. For 50 years, Mr. MacMinn has been surrounded by politicians, his ears buffeted by the warm blast of rhetoric. No table officer anywhere in the vast Commonwealth — from Antigua to Zambia — has enjoyed so long a tenure. In the raucous chamber, in which sitting members square off like irate hockey players, the Speaker acts as referee, wearing a robe instead of a striped shirt. As clerk, Mr. MacMinn is the neutral and non-partisan keeper of the rule book. He is an expert in procedure, precedent and standing orders. Some may think a half-century of listening to politicians to be cruel and unusual, but not Mr. MacMinn. "It's a rather awesome experience sitting there in the middle of the action," he said. "Bullets flying back and forth. And none of them seem to hit me." He's written what some parliamentarians describe as the bible. (No, not the Bible. He's not that old. He's only 78.) Mr. MacMinn is currently at work on the fourth revised edition of his Parliamentary Practice in British Columbia , which he hopes to get to the Queen's Printer later this year. While not spellbinding reading, it does include a chapter with the promising title of "Offer of Money to Members; Bribery in Elections." "Haven't had to consult that one," he said. "Yet." He has served 15 Speakers, observed 10 premiers. His tenure has been such that he has seen sons follow fathers - the Gordon Gibsons, as well as Bill and W.A.C. Bennett - onto the floor. He has had a front-row seat to some of the most dramatic events in the province's political history. He has felt the elder Mr. Bennett's dominating personality, heard Flyin' Phil Gaglardi in full rhetorical flight, witnessed a defiant Dave Barrett being carried out of the chamber. He takes so seriously his role as a non-partisan officer that he has not cast a ballot in the 13 provincial elections since he joined the clerk's staff. His hiring was an unexpected turn of events. On a quiet day, the 27-year-old lawyer took a telephone call at his office. The voice on the other end wanted to know if he was available that day to meet the province's attorney-general. "Just a minute, I'll check my calendar," Mr. MacMinn replied. The day's schedule was blank. He agreed to a 3 p.m. appointment. Robert Bonner, a veteran who had been wounded during the war, was a powerful minister in the Bennett cabinet. The attorney-general had two questions. "Are you closely aligned with any political party?" he asked. "I must confess," Mr. MacMinn replied, "I haven't been too interested." Mr. Bonner seemed pleased by the response. His second question was succinct, though unexpected. "Do you have a sense of humour?" "I think so," Mr. MacMinn answered. He was then dispatched to meet with a white-haired, craggy-looking fellow named Ned de Beck. The job interview with the clerk of the House was even briefer than the meeting with the attorney-general. "Are you in any way related to Hope MacMinn?" he asked. "I play bridge with her," the clerk said. "You'll do fine." His appointment was ratified by the House at its next sitting. His salary was a munificent $800. He has not left the table since. He came to law only after realizing poor science marks did not herald a career in medicine. He was born in 1930, on the cusp of the Depression, at New Glasgow, N.S., where his father was a bank manager. Earle George MacMinn had dreamed of being a doctor, passing on to his son both his name and his own thwarted ambition, if not necessarily his Conservative politics. The family moved to Victoria when George was 13. Five years later, he was bird hunting with his father on a day when what seemed to be an inconsequential decision proved to be tragic. The elder MacMinn slipped into a punt on a lake near Duncan to roust birds on the far shore. Unseen by his son, the boat tipped. After spotting the overturned craft, as well as his father's hat, floating on the water, George ran for help. The RCMP were unable to find the body. On the following day, the lake froze over. His father's remains were recovered later. He inherited from his father a love for tennis. Mr. MacMinn makes a biennial pilgrimage to Wimbledon. He has also transformed the expansive lawn between the sea and his Oak Bay house into what he calls Spoon Bay Centre Court. He thinks lawn tennis a subtle game and one easy on the knees of a septuagenarian whose backhand remains defiantly one-handed. The province is celebrating its sesquicentennial this year, marking 150 years of modern history. 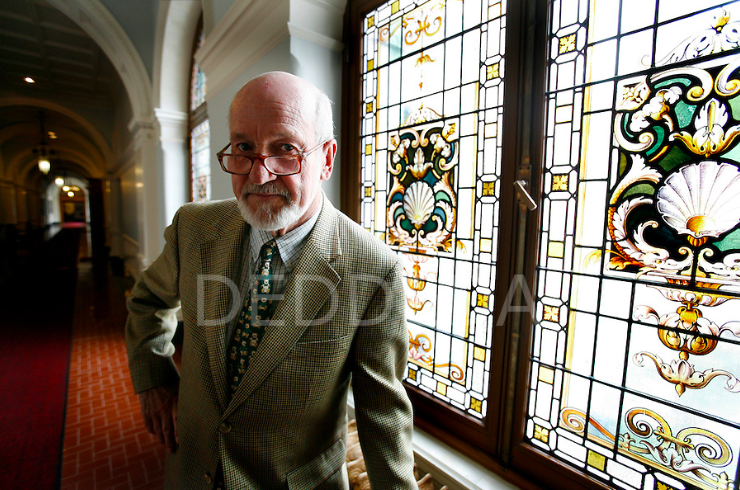 The mighty MacMinn has sat dutifully in the legislature for one-third of all those years. Jim Taylor was a sportswriter more entertaining than the teams he covered. He was certainly more popular. Generations of Vancouver sports fans knew that however disappointing the performance of hockey’s Canucks, soccer’s Whitecaps, or football’s B.C. Lions, they would be treated the following day to a funny, acerbic and satisfying sports column. Mr. Taylor, who has died on Vancouver Island at 81, showed little patience for prima donna athletes, or wannabe jocks in the press box. He abhorred cliché, eschewed the bland quote, and took delight in eviscerating the pompous. His bon mots were shared at office water coolers, stuck to refrigerators, kept folded inside wallets and purses. In the days when he wrote for the afternoon Vancouver Sun, sports-obsessed schoolchildren raced home after the final bell to read his column. His writing displayed a deft, conversational touch leavened by sarcasm and wit. It had been his ambition as a young man to be a humourist like Eric Nicol. When a hockey team agreed to pay out the remaining $60,000 on a player’s contract, Mr. Taylor conjured an epistolary exchange with his editor in which he munificently offered to not write for a similar amount. When another hockey player’s first-person account of skating in the Stanley Cup playoffs was pitched to his editor, Mr. Taylor’s response was a column in which he offered to be a sixth-string defenceman for the New York Islanders. When the Edmonton Eskimos dominated football and the Edmonton Oilers hockey, Mr. Taylor assured Vancouver readers that those fans, however happy, still faced the ignominy of living in a barren wasteland. His humour about gender roles and conjugal relations dated from the Mad Men era, yet he helped at least one aspiring young woman to break into sports writing. He was known for his generosity to young reporters, offering words of praise. His opinions about newspaper management were mostly unprintable. He left the Vancouver Sun when a new publisher forbade freelance work. Mr. Taylor’s impressive output in print, radio and on television was fueled by a desire to provide the best possible care for a daughter rendered a quadriplegic when crashed into by a reckless skier in 1976. James Edgar Taylor was born on March 16, 1937, in the Saskatchewan village of Nipawin, population 892. “To get to Nipawin,” he wrote, “you headed the dog team north and when the last dog died, you were almost there.” He was the youngest of four children born to the former Ethel Florence Quinton, the daughter of a Winnipeg sheet-metal worker, and James Edgar Taylor Sr., known as Ed, a grocer who became the proprietor of a coffee shop. Mr. Taylor’s earliest memory was of listening to hockey broadcasts on the radio on Saturday evenings with his father. At the grocery store, the boy would be plunked onto the counter to recite the roster of the Toronto Maple Leafs by memory in hopes of coaxing a nickel from customers. The family opened a coffee shop down the street from their home. Taylor’s Lunch Room served fresh pies and doughnuts, as well as sandwiches for the lunch crowd. His mother cooked, a sister served and an older brother chopped wood to keep the ovens roaring. By then, his father had been left bedridden with cancer in a room off the dining area. He died two weeks after Jim’s seventh birthday. A fortnight after that, the boy was in a Winnipeg hospital to have an operation on a lazy left eye. In his 2008 memoir, “Hello Sweetheart? Gimmie Rewrite!,” Mr. Taylor recounts awakening from surgery to utter darkness. He screamed until calmed by nuns. No one had thought to warn him he would need to wear a bandage over his eyes for two weeks. With an oldest brother fighting overseas during the Second World War, the family struggled financially, living briefly in Winnipeg, where his mother operated a rooming house before returning to Nipawin, where she opened a smaller coffee shop called Kozy Korner. They returned to Winnipeg before moving to Victoria to move in with her brother. An English and journalism teacher at Victoria High School spotted the young man’s felicity with words and got him a part-time job at the Daily Colonist covering men’s softball. The youth was so inexperienced that for his first story he set the margins of his typewriter the exact same width as a newspaper column. So uncertain was Mr. Taylor of his future that for a time he retained his morning paper route for the same newspaper. Mr. Taylor also successfully proposed a column about popular music for young people. (He mostly wanted free records.) The column, called “Needle Dust” before he renamed it “Off the Record,” is remembered for his prediction of the flash-in-the-pan popularity of a young singer named Elvis Presley. In 1963, Mr. Taylor traveled from Victoria to Vancouver to cover the Grey Cup football championship, during which Angelo Mosca of the Hamilton Tiger-Cats delivered a devastating and possibly late hit on hometown hero Willie Fleming of the B.C. Lions. The Ticats went on to win the game. Mr. Tayor raced to the ferry, wrote his stories while aboard ship, dropped them off at the newspaper office, and then covered a local hockey game. After a decade in the British Columbia capital, Mr. Taylor was lured to Vancouver to join the staff of the fledgling Vancouver Times, a daily founded by hustling advertising salesman Val Warren. The city’s third daily lasted less than a year before folding and Mr. Taylor retreated to the Colonist. The Vancouver Sun hired him to cover the football beat in 1966. Four years later, he joined Mr. Kearney as a columnist in replacing the great Denny Boyd. The sports department also included the fine horseracing writer Archie McDonald and a stellar cast of beat reporters. Mr. Taylor covered the 1972 Winter Olympics in Japan, as well as hockey’s legendary Summit Series in September, which placed him in Moscow to witness Paul Henderson’s famous goal. Mr. Taylor left the Vancouver Sun by moving down the hall of a shared building to write columns for The Province, his home for the next 16 years. In 1995, he was hired away to become the assistant publisher and marquee columnist for a weekly called Sports Only, a tentative foray into the Vancouver market by the Toronto Sun newspaper chain. After the weekly soon after folded, Mr. Taylor became a nationally syndicated columnist with the Calgary Sun until his retirement from daily journalism in 2001. Mr. Taylor was inducted into the Canadian Football Hall of Fame (1989), the Greater Victoria Sports Hall of Fame (2006) and the B.C. Sports Hall of Fame (2005) in Vancouver. In 2010, he received the Bruce Hutchison Lifetime Achievement Award from the Jack Webster Foundation, the province’s highest journalism accolade. Mr. Taylor died on Jan. 7 at his home at Shawnigan Lake, outside Victoria. He leaves a son, Christopher, and a daughter, Teresa. He was predeceased by his wife of 56 years, the former Deborah Easton, who died in 2016. For all his accolades, Mr. Taylor readily acknowledged missing out on the sports scoop of his career. At the teary 1988 press conference announcing his trade from the Edmonton Oilers, Wayne Gretzky opened by saying, “I want to apologize to my friend Jim Taylor in front of everyone.” Mr. Taylor had learned of the pending deal but out of loyalty to the family pledged to hold the information until an approved time. Instead, news leaked out and Mr. Taylor lost the scoop. He did not regret it, he said. After all, he had given his word.